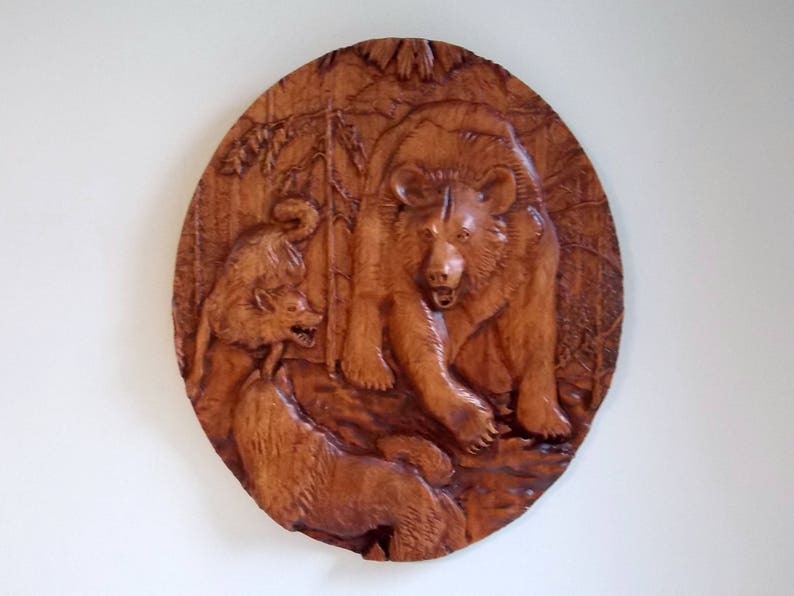 Bear Wood Carving where 2 wolves fighting a bear in the woods - Perfect wood carving for your rustic Rustic Cabin Wall Decor, wedding and anniversary gifts, birthday and Father's Day gifts, Rustic Cabin and Hunter Decor, gifts for him and his man-cave. Please take a look at our entire shop for great gift ideas! SHIPS OUT IN 1-2 BUSINESS DAY. We love our Michigan RV sign. Thank you so much, it looks great and we received it so quickly. I'm very happy that we have it for our first trip this spring. Black Bear, Bear, Black Bear Decor, Cabin Decor, Bear inside Arrowhead, Wood Carving, Wood Wall Art, Walnut Wood, No Stain, Gloss, 8 x 6"